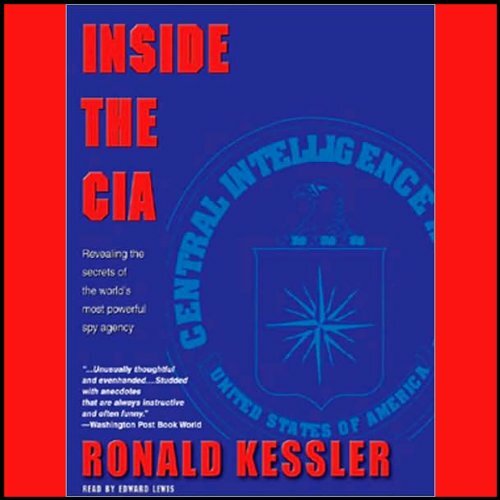 In this unparalleled work of investigative journalism, Ronald Kessler reveals the inner world of the C.I.A. Based on extensive research and hundreds of interviews, including two with active directors of Central Intelligence, William H. Webster and Robert M. Gates, and with three former D.C.I.s, Inside the C.I.A. is the first in-depth, unbiased account of the Agency's core operations, its abject failures, and its resounding successes. Sometimes fascinating, sometimes boring, and ultimately somewhat tragic, Kessler's review of the CIA provides some valuable context for readers of the 9/11 Commission report. Written before 1999, this book has little to say about terrorism, and even less to say about the direction of the CIA under Woolsey in the Clinton years. Kessler devotes a large amount of time to subjects like Iran-Contra, Aldrich Ames, the contrasting styles of Casey and Webster, and the basic structure of the CIA. The reader will get a good feel for the CIA's culture, as well as a more realistic (that is, less fictionalized and romantic) view of what the CIA does and how it operates. The narrator is, frankly, not very dynamic. Kessler also repeats some details relentlessly; the controversy over the sale of CIA-themed coffee cups and the re-defection of Vitaly Yurchenko are two particularly annoying examples. The combination of a dull, lifeless narration with frequent repetition of details occasionally makes the book a bit boring. Nevertheless, if you are interested in the CIA's history up to about 1994 this is a must-have book. This audiobook features good information on the history, organization and politics of the CIA. However, it would have been more interesting if the author had written more about covert activities. 2. Kessler's writing is pretty repetitive. Seriously, I counted six times that we're reminded of the fact that we don't spy on Great Britain or Australia, and several other facts are repeated to a ridiculous degree. I give four stars to the book and one to the reader. This is why there are professionals who read books. The author has a lisp that made me wince every time he would get to CIA (or thee eye a). Someone really should have talked him into getting Scott Brick or the like to handle this long book. Subject matter was great otherwise. After sitting through the first half of this audio book I found it almost impossible to sit through part two. The amount of detail captured in the book is way too much for the casual listener who's looking for anything but an in depth history of the CIA. The book gives a thorough explanation of what all the CIA's departments do on a day to day basis which turns out to be really boring like most other office (and government) jobs. There's not much about covert action in the book at all which is more of what I was looking for. The reading was dull and didn't engage me at all but I'm not sure if it was the content or the monotone reading. The book is definitely thorough, but at the expense of being interesting. If tons of detail is what you're looking for then you may enjoy this book. It's not bad, just dry. Ronald Kessler’s Inside the CIA is an interesting book. He has written a number of informative books including The Secrets of the FBI (2011), In the President’s Secret Service (2010) and The Bureau: The Secret History of the FBI (2003). All are very good and informative and this volume is no exception except that it is outdated. Published in 1994, it is an excellent period piece and provides insight into the CIA’s workings during that era. If one is looking for a more current perspective, this book may not fill the bill. The reading of Chris Lane is good. I thought I'd hate the book when the reader started. He had a lisp, and talked about the thee-IA. He loses soon loses the lisp - which supprised me, and did an okay job. The book ranges from being very interesting to mind numbing detail about seemingly irrelevant details. For example, a fair amount of time is given detailing Casey's personal life, including dating and marriage plans. Not a bad book if the CIA or spying in general interest you, but it won't go down as one of your all time best listens. If you like the underworld of spying, espionage and covert action, you will love this audio book. Explores every facet of the CIA, from the structure, inner working to covert missions. Will keep you tuned in for hours. Yes, the book is informative and provides a fair, less-biased view of the CIA compared to most books on the Agency, which tend to either bash it or praise it. What didn’t you like about Chris Lane’s performance? Terrible. It sounded like a computer robot or chatbot reading text. No enthusiasm or inflection. Very monotone and dry. Could you see Inside the C.I.A. being made into a movie or a TV series? Who should the stars be? Perhaps a documentary, docu-film, or like an HBO historical series (like John Adams or Band of Brothers). I'd watch it. Overall, the book is worth the read. You get used to the narrator's voice, though it's horrible. I would have preferred to read it myself (rather than listen to that narrator), but I didn't have that luxury. But, all-in-all, a good book. OMG! The narrator is Windows 98. I have never heard any narrator or story teller like this one. The audio sounds like an androgynous computer voice, I gave up after 20 minutes and chalked it up as a bad buy. Shame really as I was looking forward to this book. Never mind lesson learnt.